Lovely Christabel, the Marchioness of Haversham, is desperate to regain some personal correspondence—so desperate that she pretends to be the mistress of notorious gaming club owner Gavin Byrne, in order to attend a scandalous house party hosted by the man holding her letters. But when she agreed to let Byrne coach her on how a true mistress behaves, she never suspected how very… appealing his wicked lessons would be. Secretly determined to find the letters before Christabel, so he can use them to avenge a childhood tragedy, Gavin can’t help but be delighted at his pupil’s performance with regard to his “mistress lessons.” It won’t be long before the luscious widow is in his bed. Ultimately, though, will love or revenge triumph? “That’s too many,” Christabel protested. As the dressmaker discreetly dropped her gaze, Christabel glared at him. He was enjoying his role of lover far too much. Later, she’d have to remind him it was just a role. Heat rose in her cheeks despite her efforts to contain it. “Then perhaps I should do without gowns entirely,” she snapped. “Byrne—” she began in sheer exasperation. The next hour was taken up in sorting through a dizzying array of fabrics, styles, and colors. He and the dressmaker ignored Christabel’s comments. Not that she had many. What did she know about fashions for scandalous ladies? She did know that the fabrics were the most exquisite she’d ever seen. Or touched. She’d never cared much about clothes, but then she’d never had gowns made of fabrics like these—silks that flowed over one’s hand like water, muslins so soft and delicate she feared tearing them with a single touch. As a lieutenant, Philip hadn’t been able to afford such. Then, along with his estate he’d inherited a mountain of debt, which he’d built higher every year. But Byrne could clearly afford them. Either that or he was mad. Madness would explain his outrageously bold color choices—brilliant reds, vibrant blues, and dramatic greens. Didn’t he realize she wasn’t one of his stunning society ladies, who could easily wear clothes that drew attention to themselves? “But I thought pink and cream were the fashion.” That’s what her husband Philip had always preferred her to wear. When Mrs. Watts held particular fabrics up to her face for him to choose, Christabel saw in the mirror what he meant. Even she, hopeless in matters of fashion, could see that the rose satin made her cheeks glow a healthy color, and the holly green crepe made her eyes sparkle. She’d always looked rather sallow in her pink gowns. A delicious shiver coursed through her. Curse the randy devil, he also knew what made a woman desire a man. Him and his smiles and extravagant gifts and commanding voice—all designed to send a female’s pulse into a frenzied gallop and melt her resistance into a puddle. Well, he wouldn’t do that to her. No, indeed. She’d already allowed one man’s flatteries and flirtations to tempt her into an unwise marriage; she wasn’t about to let it tempt her into an illicit liaison with a devil who always put his own gain above his conscience. If he even possessed a conscience. He was taking this role too far, and he knew it. “Which is why you don’t need to see it now,” she persisted. Mrs. Watts’ plump cheeks turned a rosy sheen, but she gave him a cursory nod. That’s what Byrne’s extravagance bought him—compliance from dressmakers and servants. Fine, she would let him watch her be measured. She couldn’t very well quarrel with him in front of the dressmaker and destroy their pretense. Besides, he was paying for the gowns. She supposed he had a right to have a say in it. But his extravagance would not buy her. He’d find that out soon enough. Pretending she didn’t care in the least if he saw her half-dressed, she stared him down as the dressmaker helped her remove her gown. Watching him proved a mistake, however, for once she stood atop the dais in her corset and chemise, her pride forced her to keep looking as his gaze roamed wherever it pleased. It took all her strength to fight a blush. No man had ever gazed upon her like that before. Even Philip had never really taken the time to look at her. A lusty soldier, he’d been quick to join her in bed, and just as quick to retire to his own when he was done. Somehow she suspected that “quick” wouldn’t apply to Byrne. While Mrs. Watts took her measurements and scribbled them in her notebook, he did some measuring of his own. 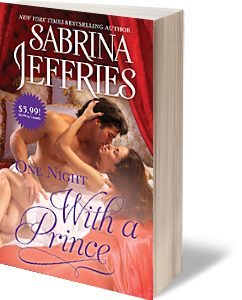 His eyes lingered on her bosom with disquieting interest, then examined her cinched-in waist and too ample hips. When he was done with his thorough assessment, his heated gaze made a leisurely trip back up her body to fix on her face. And in his eyes, she saw the truth that he wasn’t even bothering to hide. He would stop at nothing to have her in his bed, bargain or no. She cursed as a wayward thrill coursed down her spine. The impudence of the man! As if she didn’t have enough to worry about with the prospect of Papa’s destruction hanging over her head. Mrs. Watts didn’t so much as frown. Christabel glared at him. So much for trying to shame the man into behaving. “No,” Byrne said before Christabel could even answer. “Perhaps I should pop out my breasts and serve them up on a platter,” Christabel grumbled. “In being the important word,” she retorted. “She can’t,” Christabel broke in. As he opened the door, Rosa practically fell into the room. Christabel rolled her eyes. Rosa would never go meekly off when there was gossip to hear. Rosa and Mrs. Watts hurried off, and Byrne closed the door. Only then did she realize they were alone. And she was dressed most scandalously. He seemed to realize the same thing, for his gaze took outrageous liberties as he surveyed her scantily clad form. “What did you say?” He’d gone abruptly still, his eyes turning gray as a sudden tempest. Taking her off guard, he caught her chin in a firm grip and brought his mouth down on hers. The kiss was hard. Commanding. And very, very thorough. With provoking insolence, he sealed his mouth to hers as if he had every right to do so. But when he tried making the kiss more intimate, she wrenched her mouth from his. “What do you think you’re doing?” she demanded, fighting to ignore the silly pounding of her heart and the deplorable quiver in the pit of her belly. “Good. Servants are notorious gossips. So let’s put on a good show for them.” Then he kissed her again. Except that this time he succeeded in invading her mouth with his tongue, erotically, possessively. And she didn’t stop him, blast it. Worse yet, she liked it. She tried not to compare his slow, drugging kisses to Philip’s sloppy, eager ones, but it was hard to ignore the difference. Her husband’s kisses had always been a brief prelude to a quick tumble. Byrne’s kiss was an end in itself, hot, heady, and intoxicating. He fed on her mouth as if he’d been waiting half his life to taste it. The sensation made her dizzy. His hand skimmed down her throat, and she waited, on the edge of disappointment, for him to grab her breast and squeeze it roughly the way Philip always had. Instead, Byrne curved his hand around the side of her neck, caressing her throat with his thumb, up and down, back and forth, to mimic the heated plunges of his tongue between her lips. Oh, heavenly day. He drove the very air from her lungs, which might explain why her knees were going weak and her head growing faint. With leisurely care, he thrust, probed, caressed…made love to her mouth. But only her mouth. How very intriguing. Though he’d settled his other hand on her waist, he merely stroked her ribs with it. He didn’t paw her breasts or cup her between the legs or squeeze her bottom, all of which Philip would have done within seconds after starting to kiss her. And Byrne’s peculiar restraint was having the oddest effect on her. She felt restless and unsatisfied. She found herself wanting his hand on her breast. Lord help her—what kind of a wanton was she? This was supposed to be only a masquerade, remember? Boys in the Regency did not dress the way we dress children now. They wore little “frocks” like girls until they were of a certain age (I’ve seen anywhere from 3 to 6 designated). Then they were “breeched” or put into breeches for the first time. In the Regency, this meant they were buttoned into a skeleton suit. And no, it’s not the Halloween costume—these were more like our modern day rompers, but with a coat-like top and trouser-like bottoms that buttoned together.